1 of 4 in four classes. A sweep. That never gets old. Thank you to the Donovan family. Ending the year the way we began: me, Sam, and big ribbons [Show Report: Pro Am]. Plus, I didn’t have to stomp any children to win [Quietude: Plus, plus]. I rode hard. I did well. I had one major fail. In four tries, I was unable to achieve a successful victory pass. The first two times, we cantered. This has happened previously [Show Report: Decatur]. As I enjoy a good gallop around the ring, I may not downshift as quickly as I should. After the third class, we trotted, but in a flat, uninteresting fashion. Fourth class. We are gonna do this thing. I planned a nice wide turn. Sam had good energy. We hit the straightaway with a smokin’ show trot. Only to have Sam spook and bolt at a dog running in the stands. The dog belong to someone from Stepping Stone. It was his own damn dog. A fact that I reminded him of. Loudly. In the middle of the ring. Oh well, if I am going to blow one element, better the victory pass than a section being judged. Not all the riders in my class had a good day. After the class, I heard reports of numerous difficulties. However, my spotters did such a good job of keeping me by myself that I saw very little. Gonna miss the tradition of ringside coaching if & when I compete elsewhere. Sam – as wonderful as he is – doesn’t do it for free. If the rider goes to sleep at the wheel, Sam is happy to oblige. For example, if I let him get strung out at the canter, he is likely to break into a trot in the corner. I have to keep a steady hand and give sharp, jabby picks with the reins. This feels wrong at a cellular level. On the other hand, I have never truly grasped the idea of contact in any discipline. It could be this is the take-and-give that dressage instructors have been yapping on about. It could be I have had the wrong end of the stick for all these years. It could be that what I consider contact has in truth been hanging on the mouth with a heavy-handed, inconsiderate pull. Sam certainly prefers when I do it his way. 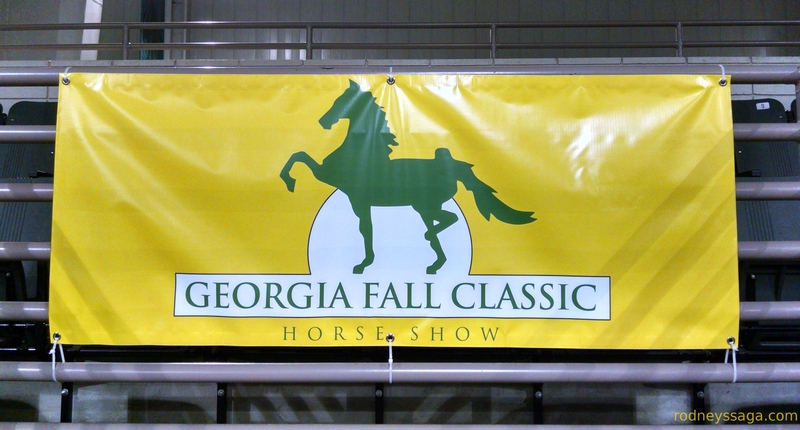 Sunday Morning > 073 – Aca Equitation WTC Adult Championship & 074 – Aca Showmanship-Pleasure WTC Adult Championship. The helmet is impossible to miss. Saturday Afternoon > 068 – Parent Lead Line. I led Elvis. 068-035-GF14 is me inciting the crowd to greater applause. Coach calls Sam the UPS horse: he’s brown & he delivers. Shopping for show food. Logistically best to do on the way home from swimming. Financially & nutritionally? Not so much. Packing. Hate packing. Have show stuff down to a series of boxes. Still hate packing. Dread of forgetting overcomes joy of anticipation. I thought about using a new phrase to avoid confusion. At least this way I'm certain of one retweet for the weekend. At least my tweet involved traveling. I wonder if Wheels Down is automated. Copilot acquired. Off to do family things. Quick trip to showgrounds to unload & feed a peppermint to fabulous show horse. Now hotel, bed, & done driving. Good morning! Are we ready to horse show? Early classes, so not much from me right away, unless copilot feels chatty. Spent the last 2 hours dreaming about getting to – or not getting to – the 8 o'clock hair & make-up call. Not restful. 1 & 1. Victory to the blue helmet! I’m getting quite fond of this hat. Think I could get away with it in dressage? Today's epiphany: get an organized transition & don't let my horse collapse into a heap. Don't have to re-organizing the canter. Well, duh. Also a tidy canter equals a tidy downwards transition. Also duh. Signature Cream of Celery Soup. 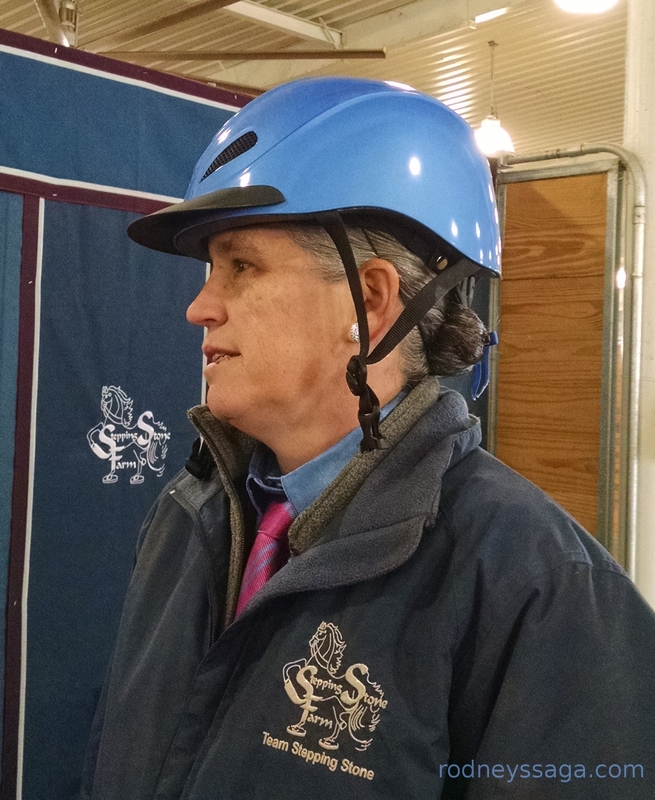 SSF rider won the Horsemanship Challenge: 22 riders, 2 rounds, 2 strange horses. You go girl! Good morning,. Are we ready to horse show? Rain but stalls, passages, & warm-up is covered. Show ring is inside. We be good. Back at hotel for deprincessification. Back to showgrounds. Getting horses ready for afternoon suit classes. Yeah, there are a lot of ribbon pictures. But we got a lot of ribbons. Plus, the show was nice enough to purchase championship ribbons for Academy. They didn’t last year. Equitation class called for "sandwich figure 8." The two riders did different things, so still not sure what one is. “A sandwich figure eight is two figure eights done one on top of the other. Normally it’s done by trotting the first circle to the left, canter the second circle to the right, canter the third circle to the left, trot the fourth circle to the right. Stop. You want all four circles to be of the same size, so it looks like you are tracing an identical pattern.” Machogirl on Cutback Chat. Both riders got the pattern but did two (or more) trot circles, then two (or more) canter circles. Group fail. Partying with the trendy people in Atlanta. What am I doing here. Hotel. Good to stop moving. Yes, I took them into the hotel room. Yes, I hung them up to admire. Yes, I am 12 years old. I believe I have mentioned this. Good morning! Are we ready to not horse show? I'm not. Keep thinking I have to get to the barn for 8 am hair & make-up. Family stuff this am. Drive home in aft. C U then. 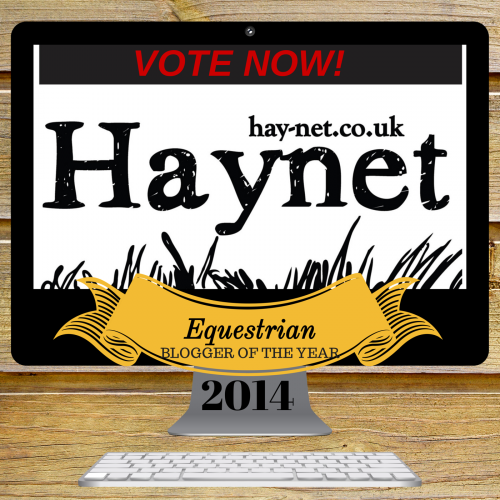 Click here to vote for blogger of the year. Congrats! Sounds like a grand weekend. Katherine, you were wonderful this weekend! Now, let’s see if we can keep it together through the winter! Congrats! Sounds (and looks) like you (almost) had fun? Well, I won, which is always fun. 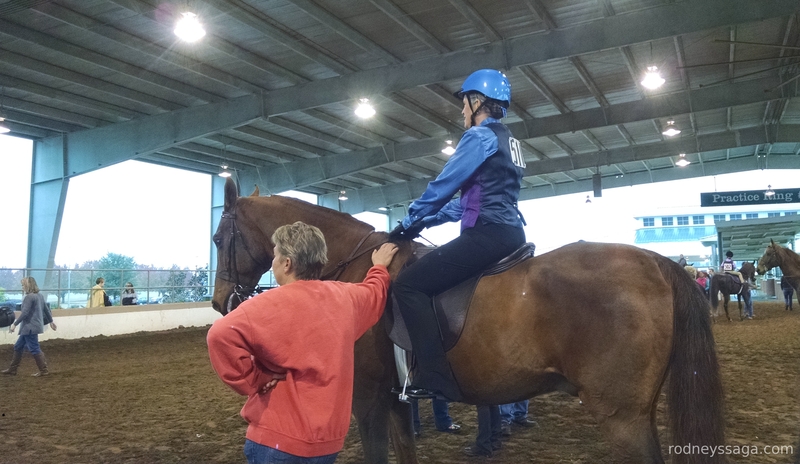 Also, I am learning what it takes to ride well, regardless of saddle style.